Potatoes are not just for dinner! These Roasted Potatoes with Sour Cream and Onion Dip make a simple, crowd-pleasing appetizer, too. 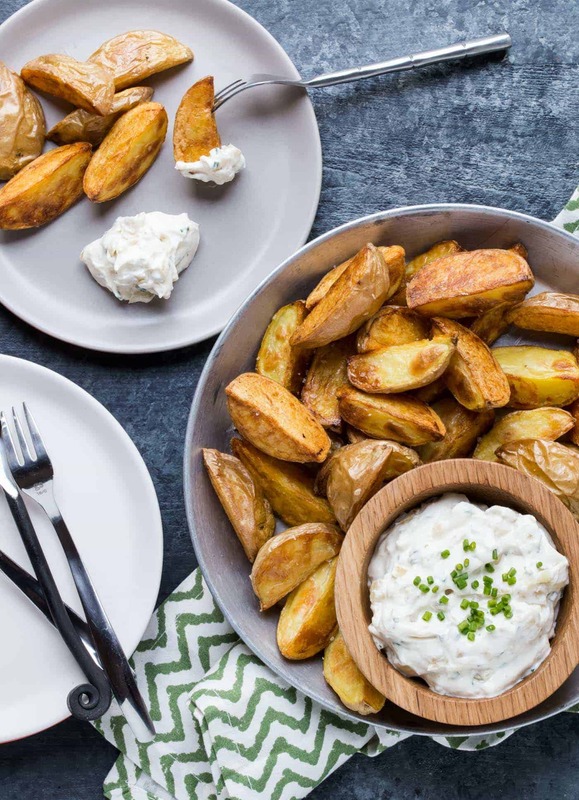 Now I’m never one to turn down a french fry, but these Roasted Potatoes with Sour Cream and Onion Dip are the closest thing I’ve had recently that would make me forgo my favorite version of potatoes. Especially because this recipe requires no messy frying and makes a fantastic appetizer for a crowd. You’re welcome to swap in your favorite dipping sauce, but this homemade sour cream and onion dip is not to be missed. I lightly caramelized the onions to give the dip a slightly sweeter flavor than your average sour cream and onion dip but the end result is still plenty savory. You can easily make the dip while the potatoes are roasting, but I recommend making it a day or two in advance if you can. The flavors develop even more after a rest in the fridge. Tip: No time to make your own sour cream and onion dip? Grab a container at the store when you’re there buying potatoes. Roast the potatoes right before guests arrive and set everything out buffet style so guests can graze and dip to their hearts content. 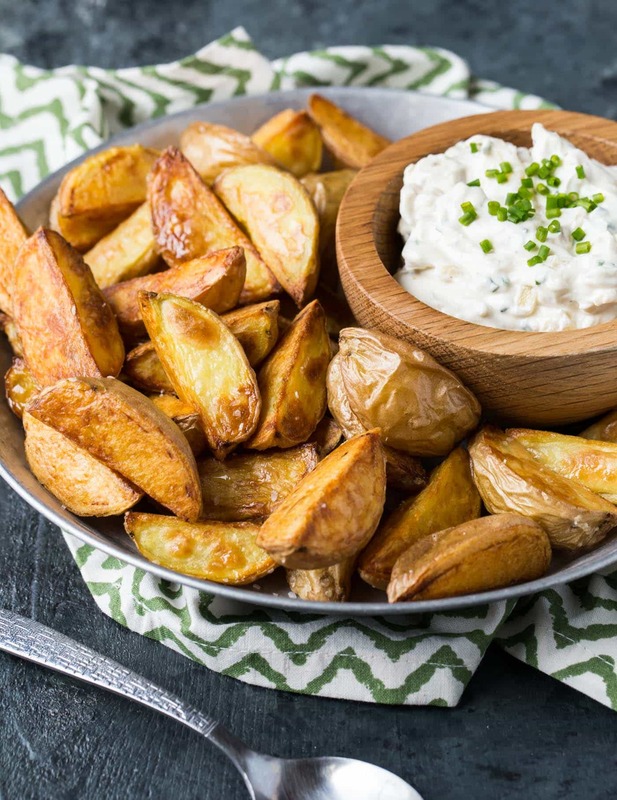 Your guests may be surprised to see Roasted Potatoes with Sour Cream and Onion Dip on the appetizer spread, but I guarantee they will be converts after just one bite. P.S. This appetizer works for your gluten-free guests, too, as long as you use gluten-free mayonnaise. Place two baking sheets in the oven and preheat to 400 degrees. Combine potatoes, olive oil and salt in a bowl, stirring to coat potatoes completely in oil. When oven is ready, divide potatoes on baking sheets, making sure potatoes are not crowded. Cook for 20 minutes, flip potatoes, rotate pans and cook for another 10-20 minutes or until done. Serve warm with dip. God gracious ! This is great ! Photos too ! Thank you and have a pleasant day !